a number of multi-tool options. Like a Boy Scout, Are You Prepared? Last week while we were out riding out new mountain bike tandem. I heard a jingling sound coming from the rear of the bike. I asked my wife if she could tell what it was and she thought it must be something in our tool bag. Well our tool bag is not in the rear so after I heard it again I decided that we needed to stop and find out what it was. As it turns out, the five bolts of the granny chainring were all about to fall out. No problem I thought, with my trusty multi-tool, I’ll just tighten those suckers up right quick! Fortunately this time I was prepared. I had a tool and all my chainring bolts. This has not always been the case. There’s been broken derailleurs, broken spokes, snapped cables and busted chains. I once gave a stranger one of my two tubes only to have three flats later on. It’s easier to be prepared if we know what we need. What do we need to be prepared? I like to think of packing my repair kit in terms of levels of inconvenience. The more inconvenient it is to break down the more stuff I should bring. For example, during a quick road ride up Emigration Canyon or a single speed loop of the Shoreline Trail, something more than a flat tire won’t be that big of a deal. However, a problem on the Whole Enchilada in Moab or a weekday Morgan Loop could leave a rider walking for a long ways. If, like me, you don’t want to carry more than is necessary, bicycle repair kits can be broken down into categories. While spare tubes, pumps and tools are obvious, some of the above items may be unknown to the new cyclist. Valve extenders, for example, are an attachment that allows a normal tube to be used with an aerodynamic wheel. You’ll need one if you get stuck without a special long valve tube. Another important item is a tire boot. This piece of an old tire is worth it’s weight in gold (it weighs nothing, takes up no space) when you have a large cut in the tire. In the event there is no tire boot, a dollar bill or an energy bar wrapper can work in a pinch. Once all these items are collected, how are we going to carry it with us? For riders that wear jerseys with pockets on the back, well, in the pockets of course. That’s what they were made for. Many riders opt to use a small bag, or pouch that stores under the saddle. When purchasing this, be sure that it is large to carry everything necessary. Personally, I like a pouch that just barely fits what I want to carry. That way, there is no room for things to rattle around. Mountain bikers have it easy. Most are already wearing a hydration pack with space for everything and more. Keep in mind that just having the equipment to make repairs is not enough. 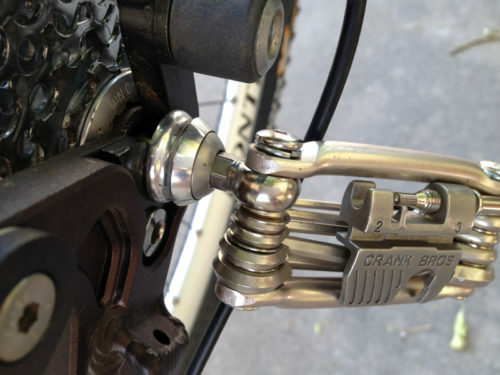 It is equally important that the tools are compatible with all the parts of the bike and their locations. Any multi-tool will reach handlebar and stem bolts. Likewise seatpost or crank arm bolts. But the tool in my tandem repair kit that day was barely able to reach the inner chainring bolts. Tightening those five bolts took forever. I also discovered it has difficulty reaching the rear axle bolts. And the four millimeter hex wrench has been lost. The above list is by no means the be all to end all. 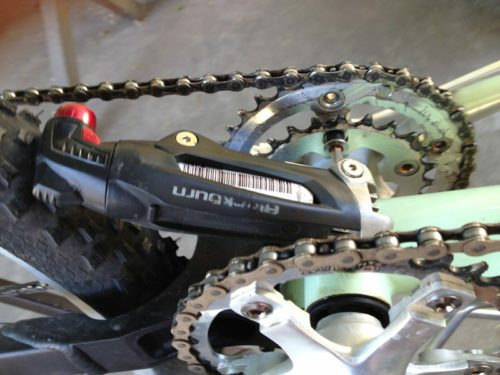 For a while one of my friends used to carry a crank puller and bottom bracket tools. In addition, remember to pack extra food and clothing in case the ride goes longer than planned or the weather goes bad. It has been said that during adventures you should expect the best but be prepared for the worst. I guess I may have to change my travel mantra. 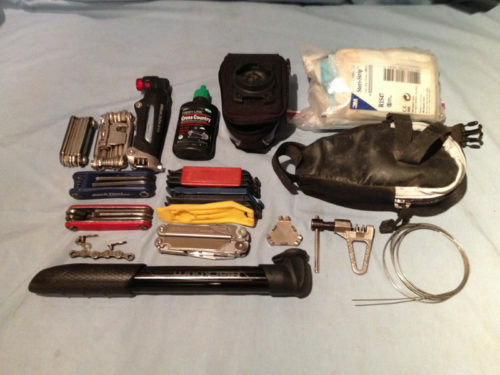 One Response to "What’s in Your Bicycle Tool Kit?"